We’ve all seen a movie or read a book where the villain is portrayed as having more than one personality — they can be sweet as pie one moment and turn around and murder their entire family the next, only to deny any knowledge of the crime. 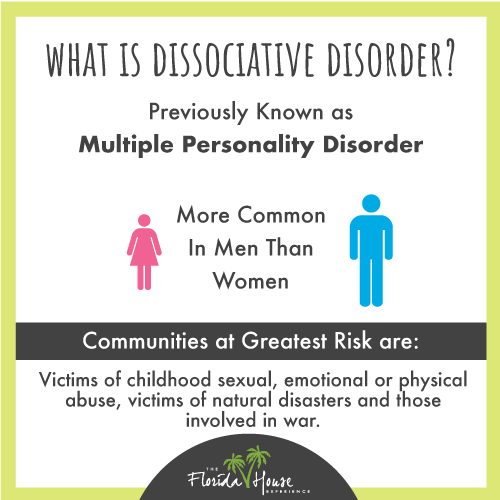 This type of inaccurate and sensationalized portrayal of dissociative identity disorder, or DID, is one of the reasons why dissociative mental illnesses have long been misunderstood and feared. Previously known as multiple personality disorder or MPD, dissociative identity disorder is a disorder that impacts your ability to remain connected to the here and now. It’s more common in men than it is in women, and it tends to impact people who have been exposed to trauma. Victims of childhood sexual, emotional or physical abuse, people who have experienced natural disasters and those who have been involved in war are at the greatest risk of developing a dissociative disorder at some point in their lives. According to the American Psychiatric Association, there are three known types of dissociative disorders, including dissociative identity disorder, dissociative amnesia, and depersonalization disorder. All of these disorders have the potential to disrupt all facets of your mental functioning, leading to far-reaching difficulties with everything from your memory to your day-to-day behavior and your perception of the world around you. How Common Is Dissociative Identity Disorder? Right now, the actual number of people who are living with dissociative identity disorder is unclear, due in part to the fact that DID often goes undiagnosed or is misdiagnosed. Dr. David Spiegel, MD of the Stanford University School of Medicine, reports that one small study of DID estimates that approximately 1.5 percent of the adult population has the disorder at any given time, although other sources indicate the prevalence of DID is much lower. Because dissociative identity disorder is exceptionally complex, the actual symptoms that each person with DID experiences can vary widely in both frequency and intensity. The most common symptoms include notable gaps in memory that cause people to forget large portions of their lives during their youth. People with DID also often struggle with short-term memory issues, such as recalling how to perform everyday tasks or remembering what they ate for dinner. They may also experience short periods of complete amnesia during which they spend money, interact with people or behave in ways that are completely inconsistent with their personalities. People who have DID also have more than one identity, which may or may not be obvious to others. Those with the possession form of DID have distinctly different personalities (previously called multiple personalities) that present in unique ways to friends and family members. By contrast, those with the nonpossession form of DID also experience different identities; however, they internalize these experiences — they often feel like they are detached from certain situations, emotions or behaviors. Other common symptoms of DID include experiencing debilitating headaches, feeling depressed and anxious, and engaging in self-harming behaviors, including cutting and abusing drugs and alcohol. Some people with dissociative identity disorder may also hear the voices of their other identities, experience auditory and visual hallucinations, and feel like someone else is trying to take over their body. It’s common for DID to be confused with schizophrenia; however, a distinct difference between the two conditions is that people with schizophrenia perceive the feelings, experiences, and voices as being external, while with dissociative identity disorder, the source of the symptoms is distinctly internal. What Does Living With DID Feel Like? On the Australian-based nonprofit website SANE.org, a writer gives a firsthand account of what living with dissociative identity disorder actually feels like. The unnamed blogger describes living with DID as having a major impact on their memory — they often engage in behaviors and activities they simply don’t recall, such as moving furniture around in their home, getting a grocery delivery they don’t remember ordering or having a childhood pet. Another person living with DID named B.J. describes that before she was formally diagnosed, she tried to rationalize the disordered thoughts, memory issues and dramatic mood swings she was experiencing. She states that “I convinced myself that the things that happened to me, that was completely baffling and unexplainable, happened to everyone.” B.J. tried to normalize her symptoms of DID by reasoning that everyone loses track of time, owns items they can’t remember buying and has sudden, extreme shifts in their desires and goals. Others with dissociative identity disorder describe experiencing vivid nightmares, having frequent panic attacks and feeling suicidal on a regular basis. While many people find the idea of being diagnosed with DID frightening, for some, it can actually signal the start of a new phase in their life — they can finally make sense of the confusing and often distressing symptoms they’ve lived with for months, years or decades. If you or someone you care about is struggling with dissociative identity disorder, mental illness, addiction or a combination of substance abuse and mental health problems, we’re here to help. Our team of experienced, compassionate experts is available to take your call, chat online or answer your email 24 hours a day, 7 days a week.